Agriculture single handedly transformed the way humans lived. Communities began to form on every continent and were completely centered around the harvest. These early civilizations eventually grew into cities and then into nations. Now that humans were able to exist in a stationary state, they could devote more time and energy to matters of the mind rather than satisfying basic human needs like finding food and shelter. We naturally became curious of our existence and began ask investigative questions about our surroundings. Together with a new social way of living this mental state of being would fuel a cultural explosion over the centuries birthing religion, philosophy, science, politics & government, and art. And just as it always has, these cultural expressions and technological advancements would need an architecture to represent them. As human society began to develop and flourish, its most prized possessions would be its buildings and structures serving as billboards for civilizations - a trend that continues to this day. This connection between buildings and culture would produce various architectural styles and interpretations over time. Architecture was and still is the most influential tangible representation of a civilization. Architecture is history. Ancient Mesopotamian civilizations, like the Sumerians, Babylonians, Chaldeans, and Egyptians were some of the first to harness the true potential of agriculture to build economic wealth. Located in fertile lands along the Tigris and Euphrates Rivers (present day Iraq) and the Nile River Valley, they constructed great cities with complex cultures to support them. The first religions came from these cultures. They were polytheistic belief systems that reflected a dependence on the harvest and a reverence for celestial astronomy. Mesopotamian mythology, now extinct, is considered by most researchers to be the oldest recorded religion and the predecessor to ancient Greek Mythology. Aside from raw and unshaped stone, clay brick is one of the oldest modular buildng materials utilized by humans. Engraveed stone relief of the Mesopatamian moon god, Sin (Nanna). There are connections between Nanna and the development of Islam. These cultural ideas were expressed in the architecture. The Ziggurat is Mesopotamia's most significant contribution to architectural development. They were large pyramid like structures used as temples dedicated to the deities of their day. Like many structures of the time, the primary building material was sun-dried brick made from mud and bitchumen. Their basic form mimics a stepped pattern that retreats as you move upward. This form naturally evolved into something more refined and processional. The most notable of these buildings was the Ziggurat of Ur (2030 BC), built by King Ur and dedicated to the moon god Sin (Nanna), patron deity of the city of Ur. Ziggurats were the centerpieces to walled temple complexes and fortified cities dominating all other buildings surrounding them. The crown jewel of the city-state, ziggurats were symbols of power, bravado, and wealth to neighboring communities. Ziggurat of Ur - Predessor to the Pyramid - photograghed when the structure was re-discovered in the late 19th century. Ziggurat of Ur - Predessor to the Pyramid - photograghed in its current condition. Many parts have been rebuilt.. Along the Nile, Egyptians developed their own culture and a similar polytheistic religion built on concepts like the ‘afterlife’, burial, astronomy, divine right rulership, and early sciences such as mathematics and engineering. Both developments played a key role in Egyptian Architecture. In the early dynasties, Egyptians also built ziggurat-like structures called Mastabas. Mastabas were simple mud brick mounds that were first used as burial tombs for Pharaohs but quickly developed into vast temple complexes dedicated to both kings and gods. Their locations were often tied to the paths of the moon and sun and were crafted with careful geometry. The Egyptians refined the Mastaba form over time and through many failures. 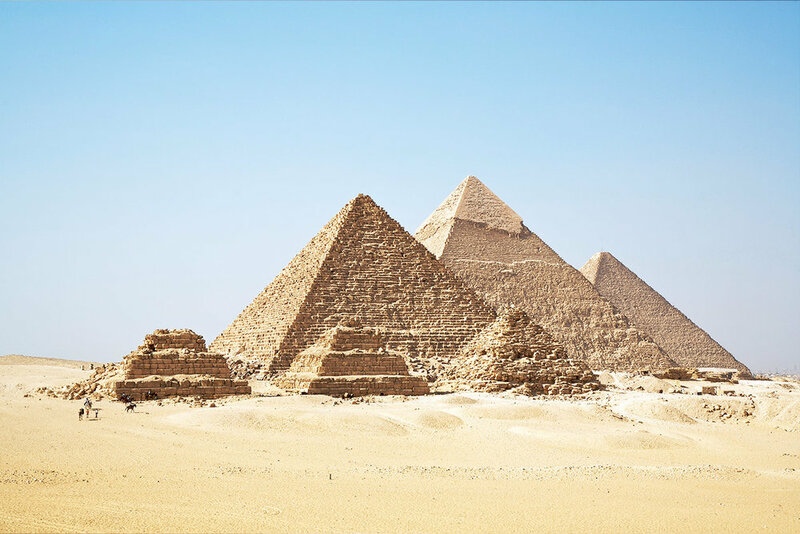 Eventually they produced its most notable architectural achievement: the pyramid - A four sided temple and burial tomb for Egyptian Pharaohs that converges at its peak. By the time the Pyramid arrived the jump had been made from perishable mud bricks to much more durable stone. This would have been a much worthier material for a structure honoring pharaoh-deities and gods of the harvest and sky. Commissioned by pharaohs, envisioned by Egyptian architects and built by both skilled craftsmen and slaves, these structures were massive and required great sophistication to build. The Great Pyramid of Giza, designed by architect (or polymath) Imhotep. is a fantastic example of the pyramid form at its peak. In comparing this structure to earlier mastabas and the ziggurat, one can easily see the progression of the pyramid idea. The obelisk is also an Egyptian architectural creation that was used at the entrance of temples and palaces. It was a physical symbol of the Egyptian sun god Ra, and by no mistake, it was also used as a time keeping device. Obelisks have been adopted by many other civilizations like the Greeks, Romans, and Americans. The Washington Monument in the District of Columbia is a direct replica of an ancient Egyptian obelisk.